How many people have you known that were afraid to live? People who quietly dwell in their own personalized safe space. Where disappointment, unfulfilled expectations and the realities of life are completely disregarded. Fear is more crippling than the severest stress. Of course their are many types of fear. Fear of loss, fear of success, fear of failure and fear of self-exposure. Professional hypnotists encounter these fears daily. Fear is the primary reason people fail to take advantage of hypnosis — fear of hypnosis not working, fear of hypnosis working or fear of some age old myth associated with hypnosis, like being suspended in eternal sleep. Which is absolutely ridiculous and devoid of fact as in all the annals of history, not so much as a headache has been proven to occur from someone using hypnosis. Fear enslaves you, cripples you with a constant feeling of doom approaching. The freedom of fear, or courage, is freedom itself. Freedom to grow, be more and expand your horizons, change long held false perceptions, eliminate dangerous behavior like smoking, excessive weight or extreme stress. When people are asked what they are afraid of, many admit to having fear, but cannot explain the origin, purpose or reason behind the fear. No specifics, just vague emotions translated into descriptions of anxiety, depression, unfulfilled expectations and failure. Fear is a thought. Nothing more, nothing less. Unfortunately the thought of fear feeds itself. The more we think of possible failure, unintended consequences and the pain they may cause, the more we think about that fear, feeding a minute flame into a raging bonfire that destroys optimism, motivation and the desire to succeed. Unchecked unreasonable fear will paralyze you. 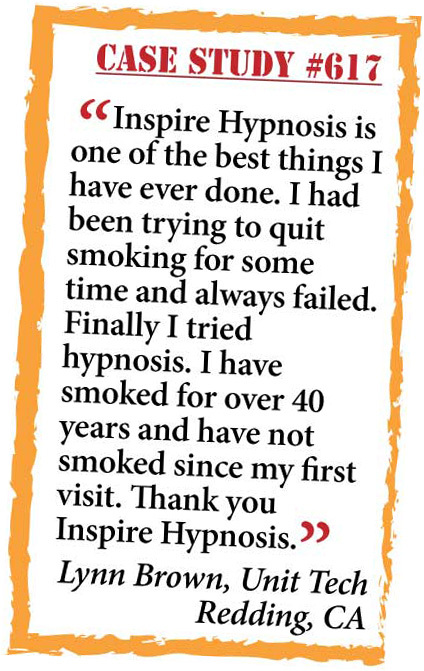 If what I describe sounds familiar, if your dreams are only that, a manifestation of wishes and you find it difficult to take action, find reason and causes for failure, I strongly urge you to consider hypnosis. Identify the fear itself, its source and a specific plan of action that can lead you on a new path of self-awareness and the organic courage that hypnosis can help you not just dream about, but posses. If fear is the obstacle that prevents you from taking the necessary actions to achieve the things you want in life, call Inspire Hypnosis (530) 387-6644 , ask to speak to Marge (me) and we can discuss the problem in more detail. I'll answer any questions you may have honestly and frankly.